So this is what I chose to read on a Friday 13th that occurred in the ninth month of the year 2013. This is, of course, absolutely inconsequential to anything I'm about to say about this book, but then again random seems to be my middle name lately. 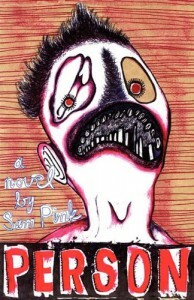 More to the point, I feel like I need to start this review by saying that this is my first time ever reading bizarro fiction, as well as the first time I read a Sam Pink book. I can't say what exactly my expectations were before starting it, as the book was a very random pick for me, but I guess that's better when it comes to bizarro fiction. Person is not about a story you could simply tell to somebody, it's not about a certain event that occurs or a specific person that you get to know and could later describe, but neither is it some abstract text about the meaning of life or, you know, something important like that. It reads like a kind of constant stream of thoughts that each and every one of us has, like an inner dialogue triggered by everything that we are surrounded by and by things we experience. It certainly feels like this is more than one person's narration, though; not necessarily in the psycho or schizo way, but more like having in front of you a person that's a collective image of all people. The overall feel of the book is definitely more on the negative side of the feels-spectrum than on the bright side; there's loneliness (maybe intentionally sought even) and awkwardness, yet nothing feels exaggerated or overdone. Although in only 87 pages, the author manages to put the person in a lot of different situations and contexts that add up to the collective person image that makes it easy for one to relate to the narrator. I entertain the idea that if my present life is the punishment for a former life, then I would never want to meet myself as the self of this former life. I mean, come on, we've all been there, right?